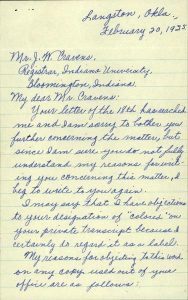 While the Indiana University Archives holds records from the Office of African American Affairs, Omega Psi Phi Fraternity, and faculty members such as Camilla Williams of the Jacobs School of Music, documentation about the African American experience at Indiana University is often sparse. It is through broad administrative collections such as the President’s Office and the Dean of the Faculties records that researchers are sometimes able to fill in some of the gaps. Recently processed, one of the Dean of Faculties collections has a plethora of information ranging from 1946-1982 (in particular from the late 1960s to the 1970s). It includes records predominantly from the tenure of Ralph C. Collins (1959-1963), Ray L. Heffner, Jr. (1964-1966), Joseph L. Sutton (1966-1968), Joseph R. Hartley (1968-1969), and Henry H. H. Remak (1969-1974) and consists of correspondence, reports, committee files, minutes, and memos which document the development of new departments and policies, administrative policies and procedures concerning faculty members, and curriculum development. 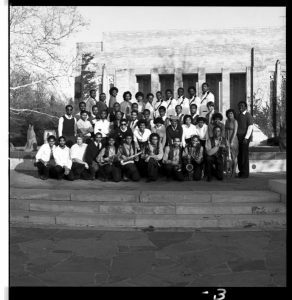 Of particular relevance to African American history at IU are records related to the development of academic and cultural programs in response to the implementation of diversity and affirmative action policies at the university. 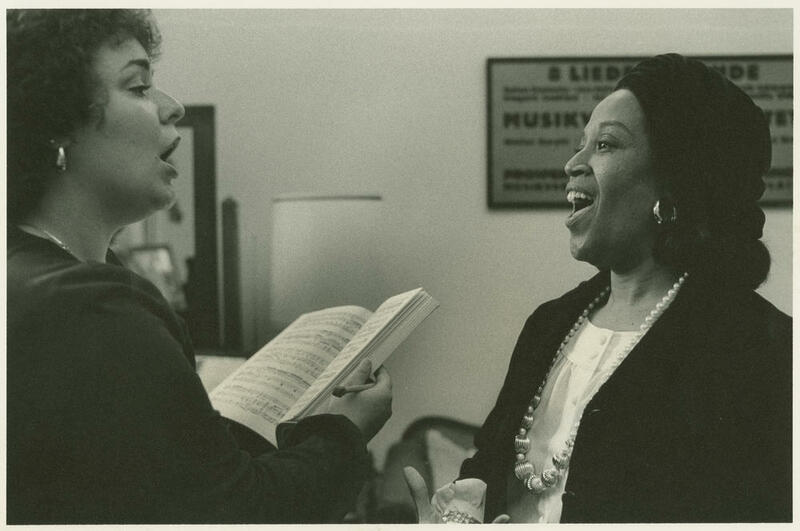 African American Soul Revue , 1982. 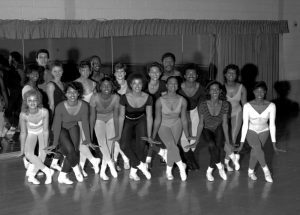 African American Dance Company, 1982.
as the Soul Revue which became one of the three student groups to make up the African American Arts Institute. The institute now includes the African American Dance Company and the African American Choral Ensemble. Today these three accomplished ensembles continue to perform in the community, and travel regionally and even abroad. As archivists we are always trying to diversify our collections. If you happen to know of any manuscripts that relate to student life (in particular to the life of minorities) at Indiana University please do not hesitate to contact the University Archives and consider donating! It’s been a little over a hundred years since the founding of Kappa Alpha Psi, one of the first fraternities for African Americans, and the organization is still thriving today. Since its founding, the fraternity has been known for its acceptance of all members, no matter their race, religious affiliation, or national origins. Many people might not know that a few dedicated young men of color founded the first chapter of Kappa Alpha Psi right here at Indiana University in 1911. Founder Byron K. Armstrong, among others, sought out a welcoming, friendly environment for the organization of African Americans on campus. Armstrong was originally from Westfield, Indiana, but attended Howard University in Washington D.C. until around 1910 when he visited his cousin, Irven Armstrong, at the IU campus. Impressed with the educational opportunities given by IU, he and a friend he met at Howard, Elder Watson Diggs, transferred. The two of them were among only ten African American students at IU at the time. White students mostly ignored their presence, and they had few opportunities to gather in recreational groups or sports (any sport that involved physical contact was off-limits). Thus, the concept of a fraternity of their own easily caught interest. They organized Kappa Alpha Nu (a forerunner of Kappa Alpha Psi) in 1911 with Diggs as the permanent chairman (Polemarch), Armstrong the sergeant at arms (Keeper of the Records), and John Lee as the secretary (Strategus). Other founders were Guy Levis Grant, Ezra D. Alexander, Edward G. Irvin, Paul W. Caine, Marcus Peter Blakemore, Henry T. Asher, and George Edmunds. Many of the founders went on to have illustrious careers. Byron, in particular, completed his Master’s degree at Columbia University by 1914, served as the Dean of Education for Langston University from 1921-1927 and 1931-1935, and continued the spread of new chapters of Kappa Alpha Psi to other campuses. However, there comes a time when every alumni has to order up a copy of their transcript in order to continue with their professional career. Byron ordered his in 1935– the same year he received the Laurel Wreath award, the highest honor given by the fraternity– only to be unpleasantly taken aback by the words “colored student” printed onto it. 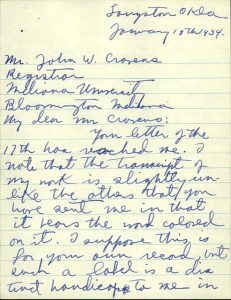 The archives are in possession of the President’s Office correspondence from 1913-1937, which contains the exchange between Armstrong and the office. Your letter of the 17th has reached me. I note that the transcript of my work is slightly unlike the others that you have sent me in that it bears the word colored on it. I suppose this is for your own record, but such a label is a distinct handicap to me in many [cases]. I am therefore asking that in the future you please leave this notation off since it was not on the original. While it has no connection with this matter I have recently learned that the University has shut colored students out of the Indiana Union. If this is true it is very unfair and certainly is not in keeping with a great University. 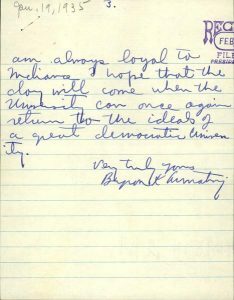 As I am always loyal to Indiana I hope that the day will come when the University can once again return to the ideals of a great democratic University. The response from the President’s Office indicated they believed they had good reason to keep “colored student” written on the transcript, but did not address his second concern at all. I returned to my office this morning after several weeks illness at home. My secretary, Miss Dillman, showed me your letter of recent date. Our plan of marking the word ‘colored’ on the cards of colored people is merely for the purpose of giving us information as to who each person is. For instance we have had several cases where four persons have had the same name, still more where three have had the same name, and in a great many cases two have had the same name. It is important in issuing photostatic copies of records or giving recommendations that we have the right person in mind. It is no reflection whatever on colored people to have their cards designated ‘colored’. We try to treat everybody here the same way, regardless of color, politics, or religion. Your letter of the 18th has reached me and I am sorry to bother you further concerning the matter, but since I am sure you do not fully understand my reasons for writing you concerning this matter, I beg to write to you again. 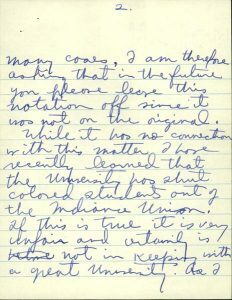 I may say that I have objections to your designation of ‘colored’ on your private transcript because I certainly do regard it as a label. 1. Many jobs will be closed to me because of such a designation, due to race prejudice. 2. I am sure you do not wish to be party to any such handicapping of one of your graduates, regardless of color. 3. This is not a common practice among the greater universities in the progressive sections of America. 4. There are other methods of identification of students without the use of such a stigma. 5. Any such practice is certainly not in keeping with the spirit of Indiana I once knew, and knowing you as I do, I am sure you would not approve of this matter. 6. Any practice which tends to divide off American citizens is certainly inconsistent with progressive democratic ideals, and must pass. 7. 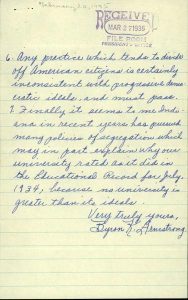 Finally, it seems to me Indiana in recent years has pursued many policies of segregation which may in part explain why our university rated as it did in the Educational Record for July, 1934; because no university is greater than its ideals. 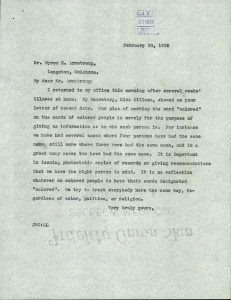 Armstrong wouldn’t stand for being racially stereotyped by his future employers, although it is unclear whether IU granted him new transcripts without the “colored student” indicator or not. In my previous article about mathematician Elbert F. Cox, I mentioned that he had the same indicator on his transcripts, though he ordered his earlier than this one for Armstrong. We don’t know precisely when IU stopped including that on their transcripts; our guess would be around the student population boom following World War II. But Armstrong couldn’t be held back from success. He went on to earn his doctorate in philosophy from the University of Michigan, and taught in several states around the country. Kappa Alpha Psi still thrives today, and credits Armstrong as a founder on its web site. Throughout IU’s history, there have been countless examples of greatness and outstanding achievement by its African American students. It is important to remember those students who, despite being faced with overwhelming social challenges due to their race, made ripples through academia that have lasted for years. For this year’s Black History Month, we remember one of those students whose accomplishments made it possible for others to strive towards the same goal: Elbert F. Cox. 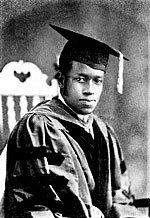 Cox was the first African American in the country, and allegedly the entire world, to receive his PhD in mathematics, but not before receiving his undergraduate degree from IU. Cox was born on December 5th, 1895 in Evansville, Indiana. Evansville, like a majority of the towns at the time, had a segregated school system that saw African American students receiving an inadequate, underfunded education. But Evansville may have been even more racially divided than many of the other towns in Indiana, and the tensions between black and white citizens would come to a violent head more than once during Cox’s lifetime. A four-day race riot in 1903 occurred when a mob of white citizens stormed the county jail after the murder of a white policeman, which resulted in 12 deaths and could only be stopped when the Indiana governor called in a militia of 300 men to subdue it. Later, in 1920, the Ku Klux Klan would make its Indiana headquarters in Evansville. Still, Cox’s family was among those who did not flee the city after the riot in 1903. They lived in a racially mixed neighborhood called Baptistown, where a majority of African Americans lived in Evansville at the time. Despite the adversity they faced from the white community, Cox had positive role models in Evansville. He could look up to the black teachers in his school, who promoted literacy and education. It is also possible that his father (one of his most essential inspirations) was a key reason for them to remain there after the riot, as he served as principal and educator for schools in Evansville and would do so for up to 50 years. 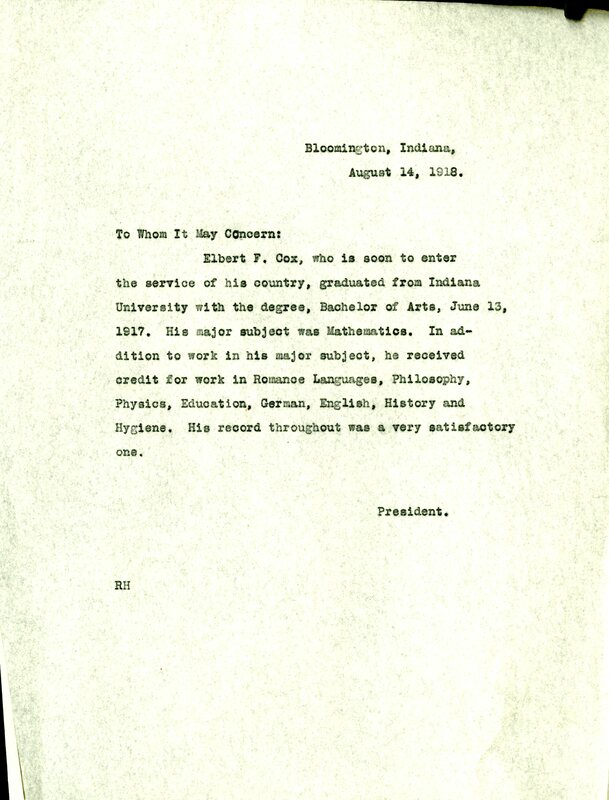 From Evansville, Cox made his journey to Indiana University in 1913 to study physics and mathematics. The math department at IU had several noteworthy professors at the time who would shape his education and help with his later academic endeavors. Some of his most influential educators were mathematics instructors/professors Cora Hennel, Schuyler Davisson, and Tobias Dantzig, who were all involved in some way with IU’s Euclidean Circle. 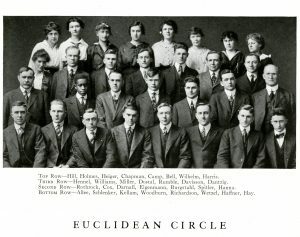 The Euclidean Circle photo from the 1916 Arbutus. Cox, Hennel, Davisson, and Dantzig are all pictured here. The purpose of the Euclidean Circle was to organize the faculty and students within the mathematics department, discuss mathematical questions, and share information. 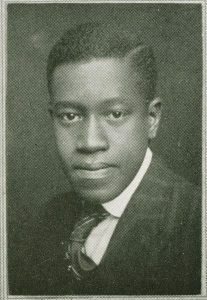 They initiated Cox on March 15th, 1915 as the first African American student to the group. Cox also made his place within other organizations such as the Physics Club, where he acted as secretary in his senior year. That year his brother, Alvalon, also joined him in the club. The African American fraternity, Kappa Alpha Psi, accepted him in 1915. He truly had an abundance of positive influences here at IU—but he, and the other African American students, still faced unfair treatment in different aspects of their education. His transcripts would read “colored student” across the top. He would be listed at the end of the graduates in the Arbutus in 1917, along with the other three African American graduates. And finally, he would be denied membership in the honor society Phi Beta Kappa despite his outstanding academic achievements. It is possible that they denied him purely because of his race. That being said, Cox (understandably) may have had mixed feelings about IU by the time he left. 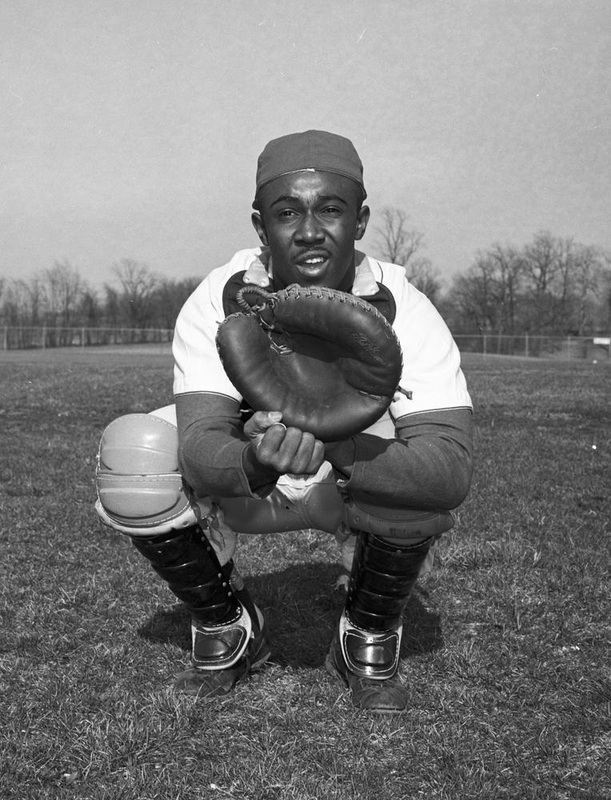 Cox spent some of his time after IU as a math and physics teacher in the segregated schools of Henderson, Kentucky. 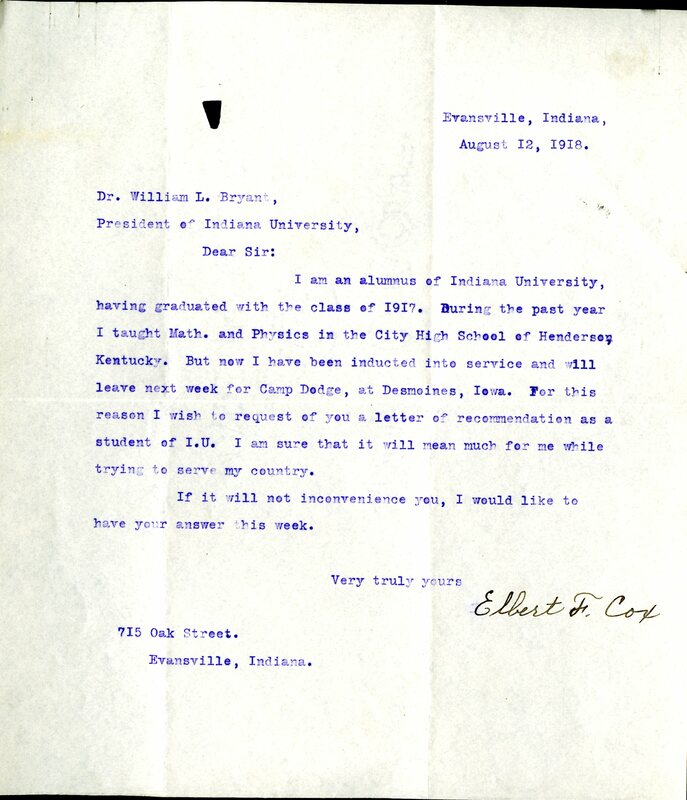 In a letter to IU President William Lowe Bryan, he revealed that he had been inducted into military service and requested a letter of recommendation. This service would take him to Des Moines, Iowa and France for around nine months. He later told his sons that he enjoyed being in the military and serving his country. From there, he went to Shaw University in North Carolina for three years as a professor of the sciences and eventually became the head of the Department of Natural Science. However, by 1921, he was ready to further his education, and began the application process for a doctoral program at Cornell University. Two of those professors from IU who had guided him during his time as an undergrad were happy to provide him with letters of recommendation during his application process. 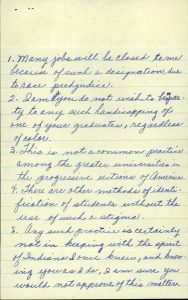 Davisson wrote in his letter, “[Cox] surpasses any colored man I have known as a student in mathematics.” Dantzig wrote two letters, worried that Cox would have “certain difficulties…because of the fact that he is of the colored race,” but that Cox would “develop into a man of whom the American mathematical world may be justly proud.” With these recommendations, Cox was able to gain acceptance after another candidate dropped from the competition. The founder and the first president of Cornell University made sure that Cornell would be a perfect fit for Cox. Ezra Cornell (1807-1874) founded the university with hopes that it would provide equal opportunities for all who wished to be educated, and greatly opposed the practice of slavery. Andrew Dickson White (1832-1918), the first president of Cornell, promoted the admittance of both women and people of color into his university. Cox was granted his PhD degree on September 26th, 1925. He completed a dissertation, which he published in the Tohoku Mathematical Journal in Sendai, Japan (after being declined by publishers in England and Germany) nine years after his graduation. One of his professors suggested publishing abroad to help legitimize his position as the first African-American in the world to receive his PhD in mathematics. 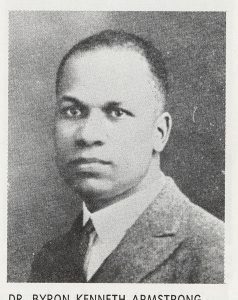 Cox didn’t receive as much recognition during his life as he did after he passed away in 1969, but he was the first African American to be admitted into the American Mathematical Society. He worked as a professor at West Virginia State College (which was then an all-black institution) and then later Howard University in Washington D.C. Unfortunately, many scholars and professors refused to recognize his thesis as legitimate. Regardless, he was said to be a popular professor who enjoyed his career. In 1954, he became the head of the mathematics department at Howard University. For many students, he would have acted as that same role model that his black teachers in Evansville were to him half a century earlier. After his death, he gained recognition as an African American pioneer of mathematics, and to this day is still thanked for the boundaries that he broke. So said Charles DeBow, one of the first African-Americans to be commissioned in the United States Air Force. He was trained at the Tuskegee Army Flying School in Alabama, making him one of the first five African-Americans to receive his wings. He was also an alumni of Indiana University. The archives are home to the Indiana University War Service Register records that dates from 1920-1946. 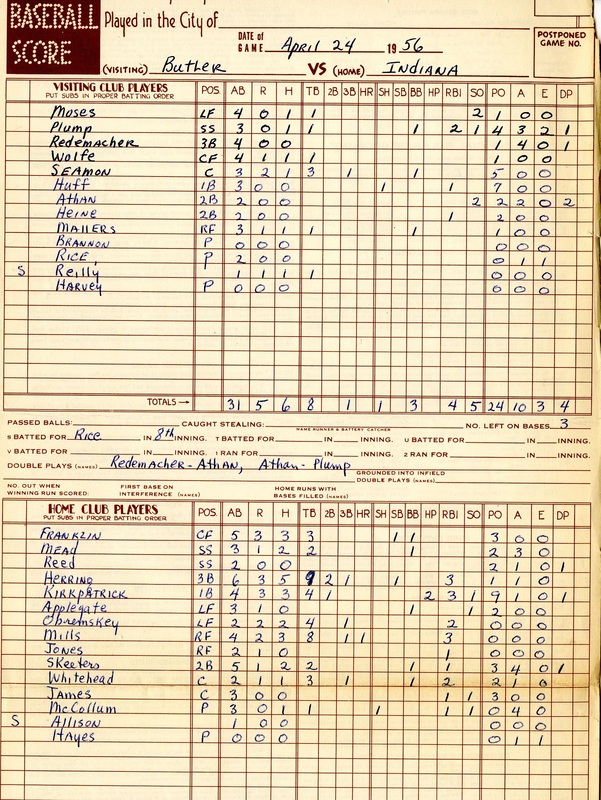 The collection, created by the Alumni Office, includes records and correspondences relating to the men and women of the university who served in World War II and was used to compile the original Golden Book. The records tell us how some students juggled their education, marriages, and careers with their promise to Uncle Sam, postponing everything for the sake of serving their country. Charles DeBow was not unique in that aspect; his father pushed for Charles to pursue a career in medicine. But the important milestone he set for African-Americans all over the country is what makes his record a fascinating find. 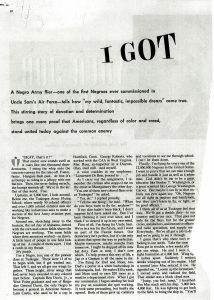 DeBow’s file includes his correspondence with the alumni office, a couple of newspaper clippings, and an article featured in the August 1942 edition of The American Magazine– a periodical that sometimes published articles about the lives of interesting American people–narrated by DeBow himself. In it, he explains his struggle with the race boundaries found both in life and the U.S. army. DeBow expressed that his dream of flying, although unrealistic, developed at a young age. Putting those dreams aside, DeBow enrolled at IU after high school. As stated previously, his father insisted that he study medicine– a profession that could allow anyone, white or black, to make a good living. But DeBow was convinced that he would never be successful in the medical profession, and so he transferred to the Hampton Institute in Virginia to study business. That’s where he first learned to fly. The government selected twenty African-Americans (out of around three hundred applicants) to learn the art of aviation. Afflicted by what DeBow referred to as “the flying bug,” he elected to drop out of college and eventually enlisted into the United States Army after months of working various jobs to save money. The glorious day had finally arrived when the War Department announced their acceptance of applications from African-Americans interested in the Air Force. It was finally a triumphant “yes” after years of hearing that same phrase “no Negroes” in the theater, in his career–in nearly every aspect of DeBow’s life. The first five members of the graduating class at the Tuskegee air school. Charles DeBow is featured in the bottom right. 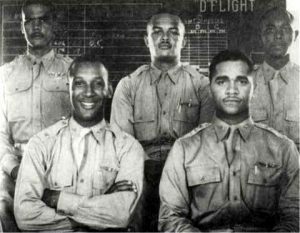 Charles DeBow became one of five members of the first graduating class of the Tuskegee army flying school in Alabama on March 6th, 1942. 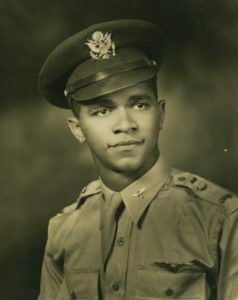 The other men in his class included: Ben Davis Jr., graduate of West Point and the son of Benjamin Davis, the first African-American to become a general in the U.S. Air Force; Lem Curtis, policeman from Hartford Connecticut; George Roberts of West Virginia, and Mac Ross of Dayton, Ohio. The commanding general of the South Eastern Air Force Center, General George E. Stratemeyer, delivered a speech for the ceremony. DeBow’s parents looked on proudly as winged pins were placed on each graduate’s chest. 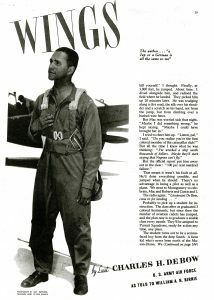 By the end of his narration in the American Magazine article, DeBow was still in training at Tuskegee. He had not yet seen the war front, but he was ready. That’s where the article leaves us. The Alumni Office at Indiana University sent DeBow’s father a congratulatory letter after the publication of this article and shared that they planned to release a feature story for him in the Alumni Magazine. But what happened after? 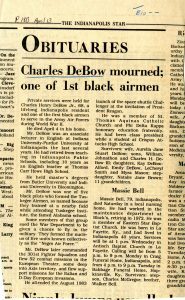 According to his obituary, which was published in the Indianapolis Star in 1986, DeBow commanded the 301st Fighter Squadron, flew 52 combat missions in the European Theater, and flew support missio ns for the Italian and D-Day invasions. His military career proved impressive and extensive, and his “wild, fantastic, impossible” dream had come true. received a Master’s from Butler University, taught English for ten years at Thomas Carr Howe High School in Indianapolis, and became an associate lecturer in English at IUPUI throughout the remaining years before his death on April 4th, 1986. If anything, the story of Charles DeBow and the other Tuskegee Airmen is one of true American patriotism: overcoming hardships and fighting boundaries in order to recognize and achieve one’s dreams. DeBow certainly broke the threshold the day they pinned on those golden wings– not just within the army, but for the entire basis of racial interactions in the United States.